For national blueberry month Fall Creek would like to acknowledge an historical figure with a true American entrepreneurial spirit – Elizabeth Coleman White, founder of the commercial blueberry industry. The modern blueberry owes its existence to this New Jersey girl, who developed and commercialized the first cultivated blueberry variety. Born and raised on her family’s cranberry farm, Elizabeth developed an interest in commercial agriculture at a young age. In the early 1900’s, Ms. White recruited anyone who agreed to find and tag blueberry plants that produced berries large enough to be commercially viable. Her measuring system? A card with blue circles of different sizes, each labeled with a price point based on size. Her instructions? 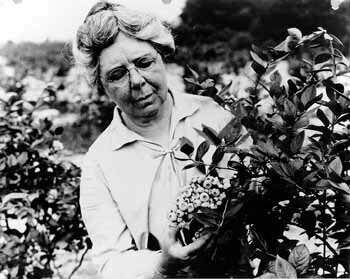 She would pay for Huckleberry bushes when “the largest berries on it will not drop through holes the size of the blue spots.” Once she had plants with desired characteristics that produced the largest berries, Elizabeth collaborated with a scientist from the USDA to cross-fertilize these plants to create new varieties for commercial propagation. From one woman’s hard work and passion, the billion-dollar commercial blueberry industry as it is now known was born.